RIMES, in collaboration with the Japan Meteorological Agency (JMA), acquired the Tidal Surge Model for use among the Member States. Using this model,RIMES and JMA built capacity on Tidal Surge Modeling for the Bangladesh Metrological Department. 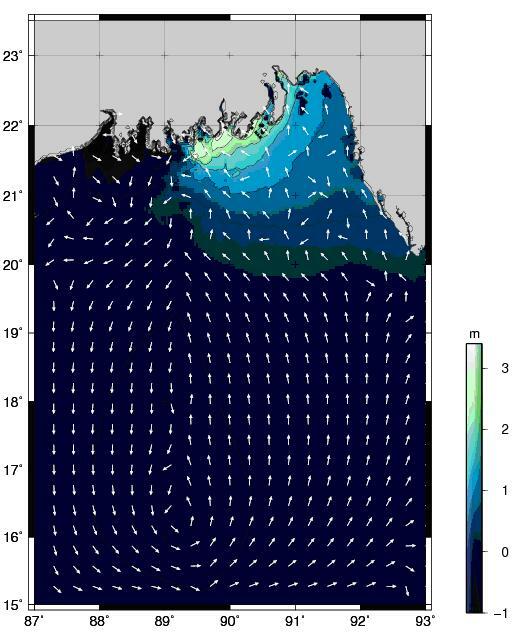 The model has the facility to consider ocean waves, the effects of stratification, and river flows; all of which have an effect on tidal surges. This allows the model to be used operationally for preparation of inundation scenarios under the influence of high wind during extreme monsoon conditions in the Bay of Bengal, as well as for tidal surges due to cyclonic conditions. Numerical products of other models can be used as a feed to generate tidal surge and inundation scenarios. During the landfall of Cyclone Sidr, the model efficiently generated the storm surge scenario in the coastal areas of Bangladesh. The model was able to generate pressure fields, wind fields, sea wave height and direction which are valuable for decision making regarding inundation and related disasters. The simulated results of the JMA Storm Surge Model are displayed (Figure 1) using Generic Mapping Tools (GMT) software. More information on RIMES tidal surge forecasting services will be available in the future.